Bolongo Bay Beach Resort is located on the southeast side of St. Thomas, just down the road from the Virgin Islands National Park. Wake up to the stunning Caribbean sunrise, and stroll out to the 1000 foot beach that sits directly in front of the resort. Bolongo Bay Beach Resort sits in an easily accessible location, just seven miles from the airport, and 4 miles from downtown. Bolongo Beach Bay Resort features a display of rooms and rates all at reasonable island prices. Choose from one of 65 oceanfront rooms with beautiful balcony views, or opt for Value Rooms that are inexpensive and just steps away from the pool and a short leisurely walk to the beach. 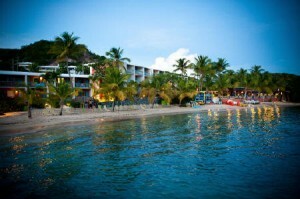 Bolongo Bay Beach Resort is famed for being an all inclusive vacation spot, providing the best services and food on the island. This all inclusive deal includes dining at some of the best restaurants on the island, enjoying Lobster, Snow Crab, File Mignon free of surcharge. Get active in island fun with at the resorts water-sports center, which offers complimentary use of kayaks, sunfish sailboats, windsurfers, aqua tri-cycles, and snorkel equipment. Soak up the sun with unlimited margaritas, and truly relax in island bliss. Bolongo Bay Beach Resort provides a variety of island vacation packages fit to meet your vacation desires all at an affordable rate!